« Non-Stop Low Generation – Great Weather! Weather certainly does not feel like December. Probably 70 today and again tomorrow. Rain looks pretty likely for Monday, then we will start to see a cool down by the end of the week. Upper 20s for the low and 40s and some 50s for the highs. They continue to run at least a low every day, almost all day. Saw a couple hour break early one morning, but low flow has been the pattern. Stan on the water with Ron and Ruth Ann this past Sunday. They had a good day on the big ruby with a ruby 2 dropper. It was a beautiful, sunny day with little wind and the low one unit running. Kathy and Ron were on their first of two full days with Carolyn. Off to a good start using the ruby 2 under the size 16 red d-ribbed midge. out for the first of their two full days. Good first day mainly on the green holographic crackleback. Also fished a ruby 2 under a peach egg and pulled a muraciever streamer. Tuesday, Theresa and Chuck pulled fish again pretty much on the green holographic crackleback Dana had Charley and Allison out, also for a full day. It was a P&P under an orange egg or the red San Juan worm for them. Wednesday Jim spent an enjoyable day on the water with Gina. They fished the ruby 2 under a peach egg and stripped the holographic green crackleback. Water was up and down this day, so fishing was up and down also. But, it was a nice day and they caught enough fish to keep them busy and happy. 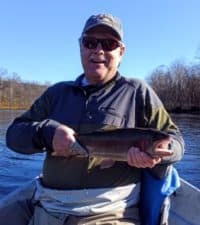 This entry was posted on Saturday, December 2nd, 2017 at 1:49 pm	and is filed under Fishing Reports. You can follow any responses to this entry through the RSS 2.0 feed. You can leave a response, or trackback from your own site.